"Here's a song for ya," and another Whitesnake live show. Recorded at Japan's music festival Loud Park 11 in 2011, it's a DVD with two audio CD package with many bonus features. You also get a look at David Coverdale's three new band members for the Forevermore tour: Michael Devin (Lynch Mob, Jason Bonham) on bass, Brian Tichy (Billy Idol, Foreigner, and Ozzy Osbourne) on drums, and Brian Ruedy on keyboards. Whitesnake:: Coverdale and Doug Aldrich. Unlike a previous live recording, Live in the Shadow of the Blues, this one is a bit abbreviated according to the Loud Park festival format. But it certainly doesn't disappoint. Call it more the compact Whitesnake performance. The set list is light on recent material but includes the title cut and Internet single, Love Will Set You Free, from the Forevermore album. Coverdale and company know better when attending a festival of this magnitude, people what to hear the great ones. So you get them including Give Me All Your Love Tonight, Love Ain't No Stranger, Her I Go Again, Still of the Night and many more. Coverdale, as usual, is powerful, engaging and thankful as he interacts with the crowd. On a more curious note is Tichy's unusual drum solo, where after using traditional sticks, he wipe out, first, chopsticks and then Ginsu cutting knives to play. The DVD contains some slide shows and fan videos; the CDs, sound check and acoustic versions of many songs, several of which do not appear on either format. Perhaps more intesting are the entries from Michael Devin's tour diary which include observations about Japanese efficiency: having vending machines that dispense cans of beer. Whitesnake fans should enjoy these bonus features. 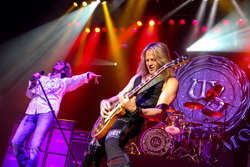 In the end, Made In Japan is tried and true Whitesnake, showing a band always professional, playing well, and entertaining their fans. Easily recommended. 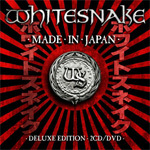 Made In Japan is tried and true Whitesnake, showing a band always professional, playing well, and entertaining their fans. Easily recommended.